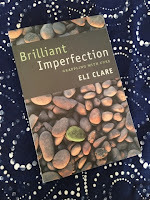 I can think of few writers whose work better exemplifies radical, deeply thoughtful, passionate, nuanced, and incredibly readable engagement with the social world and its injustices than Eli Clare. 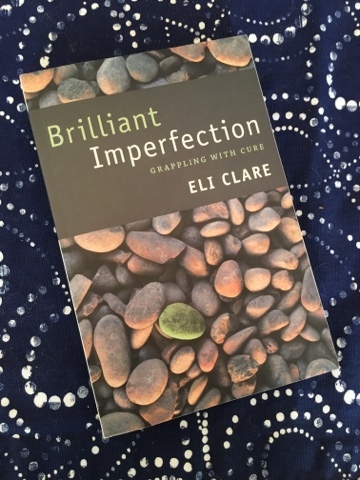 Brilliant Imperfection, as its subtitle indicates, grapples with cure -- a word and an idea that, in Clare's radical reading of both it and of the world, is about as far from the straightforward and unadulterated 'good thing' of commonsense usage as you could get. He reveals cure to be both a dense node and a driving force in the social relations that organize the oppressions felt by disabled people and many other people as well, tightly bound up with the equally deceptive and devastating ideas of normal and natural. The book's exploration of cure is not a linear journey advancing a singular thesis, however, but a skillful exploration of the complex whole of that which is wound together in, through, and by cure, accomplished by strategically entering the social tangle at key points and tracing, often in deeply embodied ways, the strands that meet there. The chapters form a cluster around the centre that is cure -- "Ideology of Cure," "Violence of Cure," "How Cure Works," "Promise of Cure" and so on -- and each chapter is itself a cluster of sections grounded in different epistemological and rhetorical approaches that are brought together to illuminate its target. The politics and ideas in the book are deeply challenging -- or, to be more precise, I felt challenged by them, and I suspect that so would pretty much any reader grounded in movement/left but not specifically disability politics, and probably at least some people engaged in a sustained way with disability organizing as well. Precisely because the book takes the complexity of the social world seriously in its analysis and its writing, it's hard to come up with a singular and simple way of characterizing that challenge that feels even vaguely accurate. It challenges dominant assumptions about what "cure" means, yes, but its relentless examination of how cure permeates the organization of a whole host of other ideas and practices and facets of the social world pushes for a much broader re-thinking as well. This includes paying a lot of attention to the interlinked character of...well, of the social world, of the aspects of our lives that we're taught to talk about as separate, and of our struggles to change the world. It is the antithesis of the ritualized but often shallow naming of race, class, and gender you see in a lot of scholarly and non-scholarly-left writing. And it feels, when these links are made, like it is a product of thinking and talking deeply about the connection in question. Even when this takes the form of a relatively brief naming of some connection or other, it feels concrete, not the kind of gestural gloss that so often passes for consideration of intersectionality. The book also embraces difference and contradiction. At several points, Clare directly addresses voices of people with very different experiences and analysis, and considers those differences seriously. Sometimes his conclusion from this engagement is an opposition no less profound than might have resulted from a more superficial consideration -- for instance, his reflections on the words of the father of a disabled girl whose awareness is compared to that of a three month-old about his choice to take surgical and hormonal steps to prevent her from sexually maturing. Sometimes the result is the introduction of new complexity into his analysis, or the admission of contradictions that cannot easily be resolved -- for instance, when considering the somewhat different analysis of cure held by a friend whose disability includes the experience of intense chronic pain. I particularly admired this willingness to let contradiction stand. A lot of the time, such contradictions in our thinking or in our movements reflect contradictions out in the world, and the impulse to smooth them over just leads to a shallower understanding. There was even one instance, in Clare's discussion of his visceral rejection of the idea that his disabled body needs any kind of fixing but his embrace of a particular surgical intervention as part of his journey of being trans, where a relatively neat resolution of that contradiction would have been possible but where he explicitly refuses it, instead engaging with the question one more time in order to unearth the continuing contradiction that he knows is still there. Even beyond all that I have to learn from this book about the integration of disability into grassroots ways of thinking about and acting in the world, I'm excited by what it can teach me about writing about the world. The introduction to the book describes its form as "a mosaic," or "a swirling, multibranched pattern of histories, ideas, and feelings." Over the course of its many chapters and their many sections -- more appropriately conceived, I think, as a cluster of clusters, rather than the blandly linear series that "chapter" and "section" tend to evoke -- it makes use of a lot of different approaches. It presents broader histories in straightforward narrative ways. It starts from particular figures or media texts and radiates outward into feelings and issues and analysis. It uses memoir. It uses dialogue in various forms, both recounting actual dialogical engagement with people in Clare's life and using a form of imaginative recreation of dialogue with archival figures. It deploys atmospheric vignettes. It traces how categories and terms have evolved, how institutions have shifted, or how they haven't. It, at points, gives full vent to emotion -- a section of direct address to a friend long dead from suicide, for example. Moreover, it is a great read, and an inspiring example of presenting challenging ideas in accessible ways. Rather than the disjointed shifting from mode to mode, voice to voice, approach to approach, that could have resulted from this experimental form in less skillful hands, it comes together exactly as the label "mosaic" intends -- lots of different kinds of little pieces that are combined to make a powerful and appealing whole. This was a wonderful read, but even more than that I am excited by my prelimanry reflections on how the lessons of this book might be relevent to challenges I'm currently wrestling with in my own work.